Lapinette grabbed the object. The Wabbit gazed at it. "The ancient bejeweled rabbit of Wablantis!" Lapinette looked puzzled. "But there's only one and we already have it." The Wabbit shook his head. "The old legend said that two were made but one was lost." Lapinette laughed. "Well, now we have them both." She tucked the bejeweled rabbit into the back of her frock. A sudden gushing noise took their attention. It seemed to come from beneath the pond. The water lit up. "Illuminations?" grinned the Wabbit. 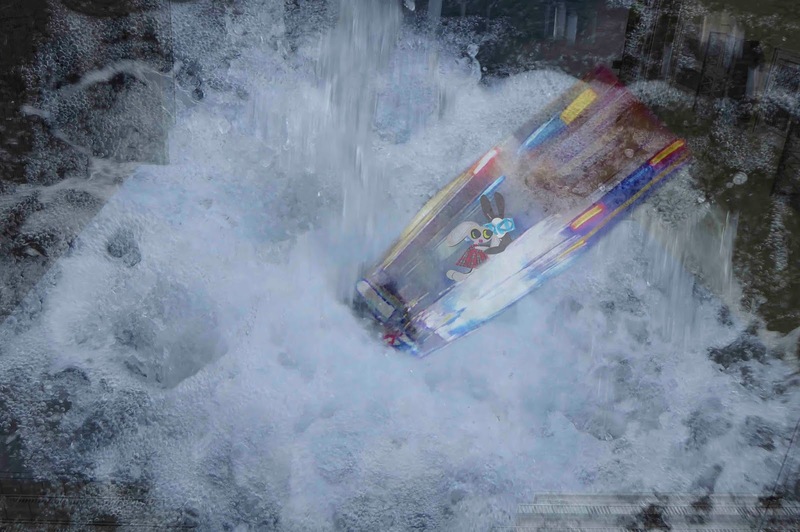 Gushing turned to a roar. Headlights carved a path through the depths. A CGT Turin bus rose to the surface like submarine. "Is that our bus?" asked Lapinette? "I'd say that was definitely ours," said the Wabbit. Lapinette squealed and hopped up and down. "Are our tickets still valid?" The Wabbit laughed. "I think we can work something out." He pointed to the front of the bus. The chocolate rabbit was driving and he waved and changed gears and revved the engine. The Wabbit hailed the bus with a smile. "How do we get on?" asked Lapinette. The bus floated higher and higher until it floated over the surface. The doors hissed open. "After you," said the Wabbit. He lifted Lapinette onto the platform and then jumped on himself. The doors hissed shut. There was a roar and the bus vanished. 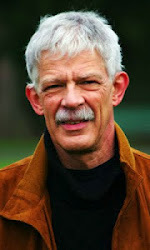 Diesel fumes hung briefly in the air and died away. Water lilies shimmered and closed over the pond. The bus and its passengers were gone. The Wabbit and Lapinette followed a path through the woods until they came to a delightful pond with a little bridge. They stood on the bridge for a while and looked at the foliage. The Wabbit grinned. "Whatever it is, I suppose this is the place we'll find it." Lapinette gazed at the pond, which she found quite delightful. "Find what?" 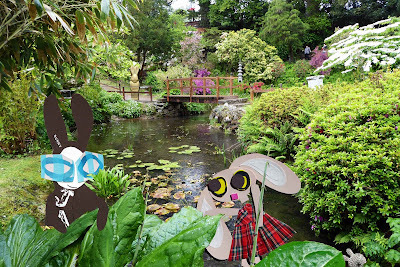 The Wabbit jumped into the pond and started to wade. "We won't know until we find it." Lapinette followed suit. She tried to keep her frock dry without success because the Wabbit was turning over every frond and kicking up a stir. He turned over stones. He grasped stalks and shook them. Lapinette did the same and together they worked away for some time. 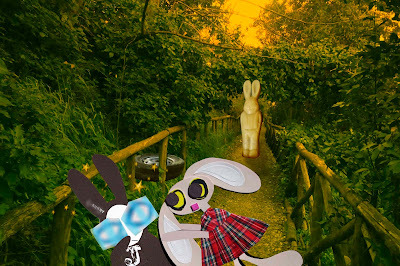 The Wabbit was well aware that the chocolate rabbit had followed them, because he could feel a stare at the back of his head, but he didn't look back. He shrugged. "We're supposed to find whatever it is and that chocolate rabbit will wait here until we do." The day wore on but they hadn't found much. Lapinette complained. "A slug crawled up my frock." "I hope it didn't get far," laughed the Wabbit. Lapinette shrieked with laughter and sprayed the Wabbit with pond water. That's was the moment she noticed something glinting. It was half hidden in the water and covered in sodden leaves. Her cry caused every bird in the woods to flutter upwards. "I found it!" The bus fell apart. It was a sudden as it was unexpected. 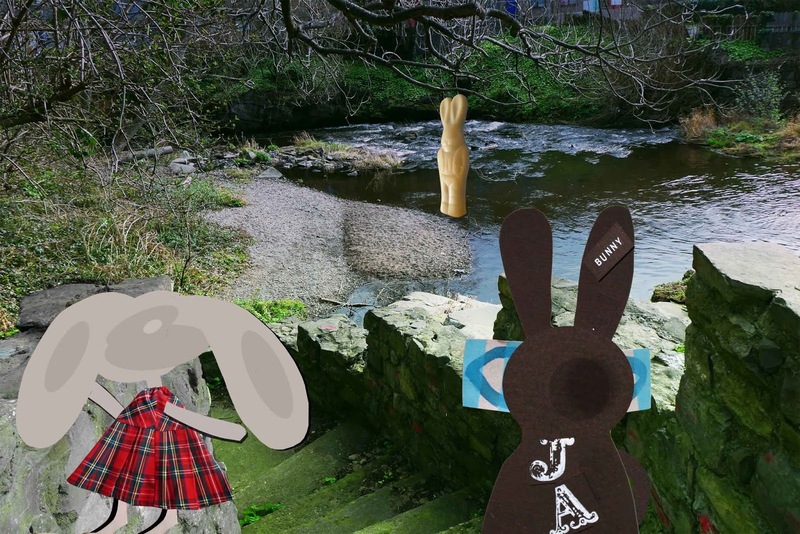 The Wabbit and Lapinette had secured partial control and the daring leap over the canal tunnel had been successful. They turned to congratulate each other but in the next moment they found themselves in the open, spiraling down towards a bridge they'd never seen before. It looked like a fancy clothes hanger and it was coming up fast. Bits of the bus flew though the air. A seat narrowly missed the Wabbit. A seat belt buckle grazed his nose. Lapinette automatically grasped for a flying steering wheel, but it whirled from her grasp and fell into the darkness. One of the wheels loomed out of the sky and flashed past her head so close she could smell rubber. 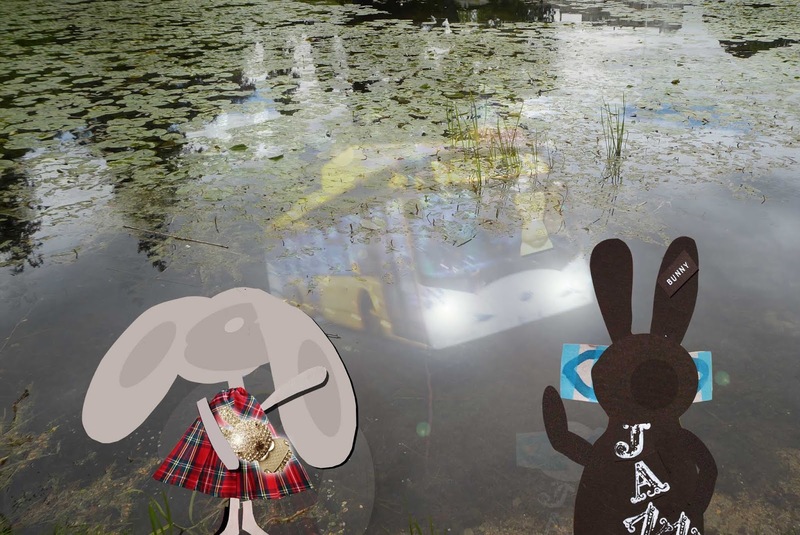 The Wabbit tried to see what lay beneath the bridge but it didn't seem to be water - it looked more like concrete. He gritted his teeth and called out to Lapinette. "Brace in the unexpected event of a hard landing," Lapinette gripped her billowing frock and shouted against the roar of the wind. "I'm all braced up." Something red loomed out of the darkness and both of them saw it. The Wabbit spread out his paws. So did Lapinette - but the object veered the Wabbit's way. With a single swipe, he grabbed it and held it tight. "It's the red button!" "What are you waiting for?" screamed Lapinette. "Hit it!" 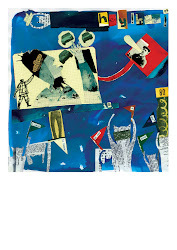 The bus careered down the River Po but when it reached the mouth of the Doro it swerved left and headed across the city. Torrential rain lashed the windows. "Never mind the weather," sang the Wabbit from gritted teeth. It grew chilly inside and the wipers gave up. "As long as we're together," trilled Lapinette. Lights flickered but then held steady. Headlight beams lit the churning water that threatened to engulf them. The Wabbit grabbed at the steering wheel. He managed to budge the bus trajectory slightly and so avoided three bridges. Lapinette poked at the brakes, but there was no response. A heavy wake lay to the back of the bus. Waves washed over footpaths and up embankments. 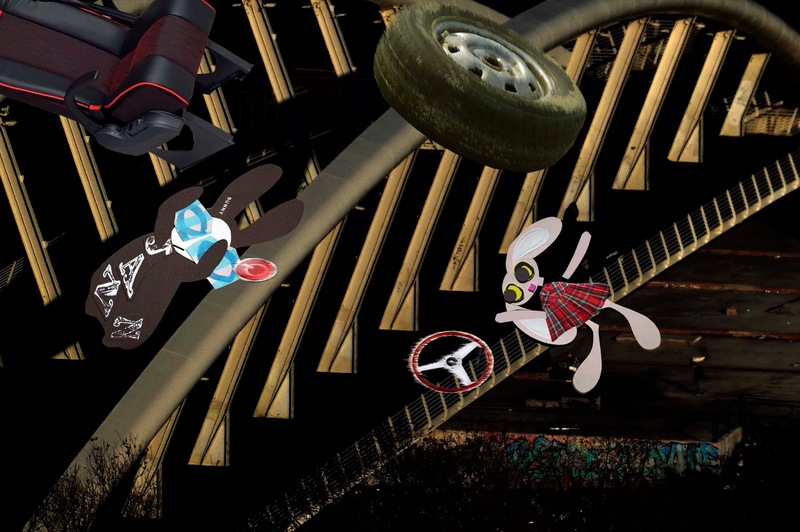 "We seem to have missed all the halts," laughed the Wabbit. "No-one's out tonight!" laughed Lapinette. "Do you think we're late?" grinned the Wabbit. "If we're late, we can take our time," shrugged Lapinette. As if in response, the bus lurched, wallowed for a second and stopped. Water rose above the windows. "Whoa, steady on," groaned the Wabbit. Lapinette jabbed at the throttle. 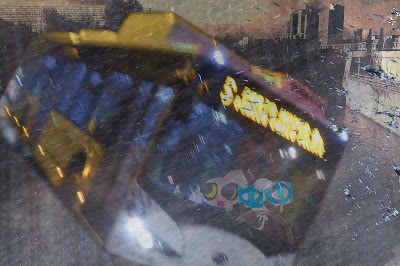 The bus lifted, then skimmed along the surface, bouncing across turbulence like a hydrofoil. But a subterranean canal loomed fast. The Wabbit looked at Lapinette. "Over or under?" Lapinette jumped with both feet on the throttle pedal. "Over the top ..!"